GovIntranet Version 4.2.1 contains some bugfixes and introduces a new content type and taxonomy for “News updates”. Download from Github. News updates are a form of alert in addition to the “Need to know” functionality. 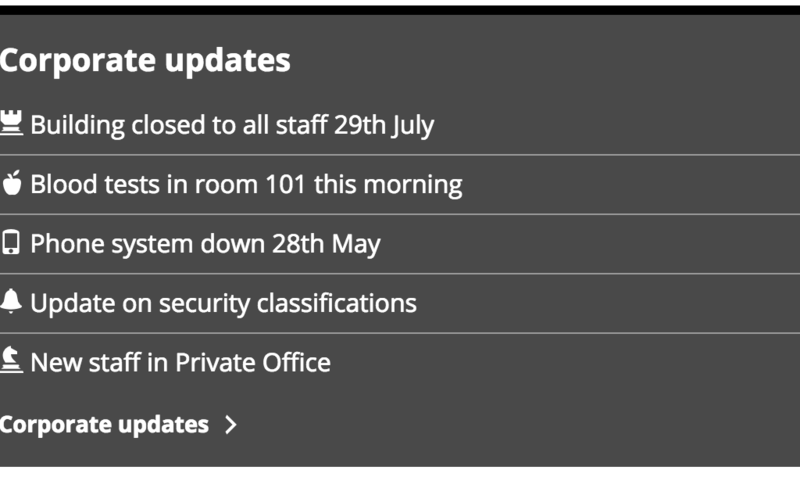 The main difference is that updates will not appear in the main news feed, and you can categorise them into “IT Service Updates”, “Security updates” etc. A new plugin allows you to display either all updates or a single category of updates in widget areas, with custom colours and icons. After upgrading, turn on the new module in Options. You can carry on using “Need to know” news or you can upgrade your current posts to “News updates”. A plugin is included in the update.